Texan Girl Talks: The first day is always the hardest. Been up since 5 am, and no coffee. Hello Advocare 24 day challenge! Yes, you read that right, NO COFFEE. This struggle is real. For the past 3 weeks, I have literally eaten what ever the hell i've wanted, while it's been yummy... I've gained some weight and I don't just mean by the numbers on the scale. My mind is heavier as well. GUILT. My clothes are a little tighter and I have much less energy. I'm not at the physically active capacity, I was at three weeks ago. MORE GUILT. Rather than beat myself up, I will get over it and move on. Today was a clinical day and I was soooo tired this morning. 5am came wayyy too fast. I quickly made a cup of hot green tea with stevia and my spark. 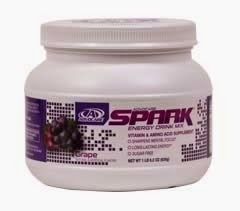 I am using Grape Spark! I think it's the best flavor out of all of them. I am still going to have something warm to drink in the morning to fill my coffee void.. It's a large void, people. I've read some people warm up their spark?! is that a thing? I also coughed down my wonderful Peaches and cream fiber drink. Peaches and cream is exponentially better than the Citrus fiber drink. Just take my word for it. Breakfast: 1 egg, 2 egg whites, whole grain toast and half of a banana. After all the green tea and spark it was hard to think about eating anything else. Which is completely out of character for me, but I was rolling with it. Lunch: I conveniently was too tired to make lunch. Lame. It was hospital salad bar for lunch! It wasn't that bad, but I definitely will be making a tastier lunch for the next clinical day, this is the only way i'll get through this. Snack: I got home from clinical and was absolutely ravenous. I knew I had to get some kind of workout in, but I needed to replenish, I ate carrots and guac. Weirdest combo ever, but it kinda worked for me. I had another Spark and ran out the door for a workout. Dinner: was pretty tasty though. I made chicken on the George Foreman and roasted asparagus and broccoli. I ate it as slow I could to be full as possible and not want for any sweets. This is my struggle. I eat WAY too fast. I probably won't post what I eat every day, but I do want to feel accountable some how, Don't worry you'll probably hear a lot of bitching and complaining. Eat Oreos for me, please? Hope you rocked your Monday! Labels: 24 day challenge, firsts! Fright nights with my Golden Girls. Smells like a college rejection letter. 16348739247328 things happened last week.